Ridesharing is officially here to stay. No matter where you go, there are now car services that can pick you up at a moment’s notice and take you anywhere you need to be. Popular rideshare companies include Uber, Lyft, Via and many, many more. And while it’s likely that you’ve ridden in a rideshare before, there are a few important things to keep in mind. Use these tips to get the most out of your experience. That is the question. Most rideshare apps will allow you to tip your driver for his or her service. And while ridesharing is still a relatively new phenomenon, you can follow the same rules for tipping as you would for any other service—if you feel inclined, add a few dollars to your total bill for a tip. AKA, “Should you really be talking about that right now?” Never forget that the person driving you around can hear everything you’re talking about. Just be aware of this as you accept phone calls and have conversations with your fellow backseat passengers. It’s your business how you choose to conduct yourself and what you choose to say—but chances are, your driver doesn’t want to hear about the date you had last Friday or the mole you just got removed. Be courteous. And don’t be gross. Most rideshare companies thoroughly vet their drivers. But if you feel unsafe at any time, make sure to report the driver to his/her company so others don’t have the same experience. And as always, if things get really out of hand, alert your local authorities. Want to become a rideshare driver? 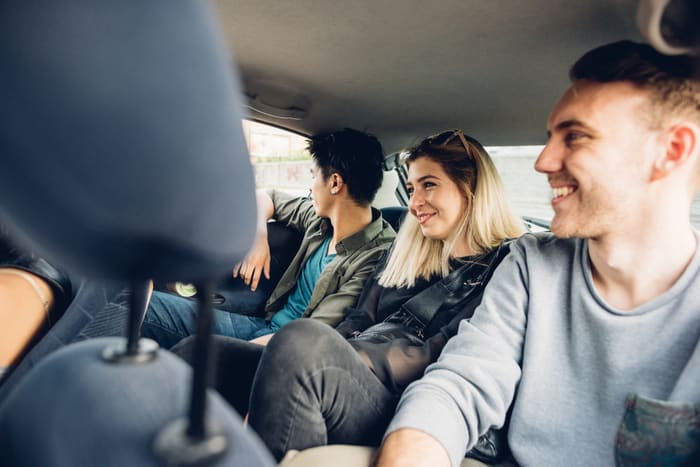 Ridesharing can be a great way to make some extra cash around the holidays— and some people have even made careers out of it! If you’re interested in becoming a rideshare driver, do some research before diving in. Most rideshare companies perform extensive background checks and require drivers to own newer car models. First and foremost, drive safely! Your passengers deserve a safe, enjoyable ride. - Don’t push it. If you start feeling tired of driving, call it a night. This isn’t the time to see how far you can go. Some passengers will want to talk—others won’t. Feel this out on a case-by-case basis to make sure your passengers have a comfortable ride. Some areas will naturally attract more rideshare passengers than others. Station your car there for pickup, but make sure you’re familiar with the city you’re driving in so you can easily navigate the different neighborhoods. Cradeur, Jay. (2017, November 29.) 8 Rules to be a Successful Rideshare Driver.